Eating preferences—we all have them. Some choose to be vegetarians. Others pursue the vegan route. Then, there are folks—myself included—who are omnivores. Growing up on a family rancher, there was only one way to eat—a balanced meal that included meat and vegetables. But I was an open-minded 10-year-old ready to experience the vegetarian menu. I respect everyone’s right to eat the way they choose, even if I don’t agree. But my active lifestyle wasn’t conducive to the vegetarian option. My body required, and still does, an abundance of essential nutrients derived from a balanced diet. Who knew my parents were so smart? But all too often I see false statements about beef. That bothers me when there are several credible resources to reference for information about beef, including the Texas Beef Council and The Beef Checkoff. So let’s start a conversation about beef and the other foods on your plate. 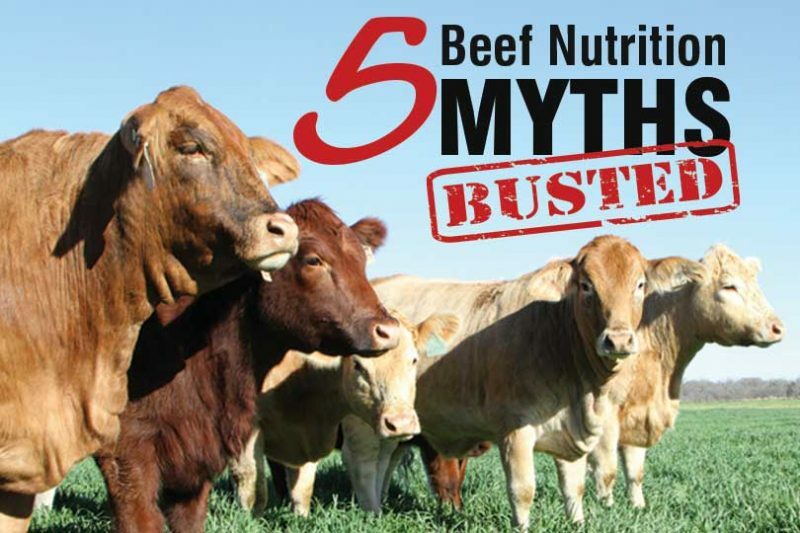 Myth: Beef is too high in saturated fat to be heart healthy. Fact: Six fresh beef cuts display the American Heart Association’s Heart-Check certification, signifying they are extra-lean. And more than 50 percent of the fats in beef are nonsaturated. Myth: Beef makes you fat. Fact: Beef includes many essential nutrients, including iron, zinc, vitamin B12 and more. Replacing some—not all—refined carbohydrates with the high-quality protein found in lean beef can help you manage your weight. Myth: Beef weakens your bones. Fact: Higher protein consumption is actually associated with improved bone mass. Myth: Hormones in beef are unsafe. Fact: All meat has hormones. Actually, everything that lives and breathes contains hormones. Fact: Just because we can survive without meat, including beef, doesn’t mean we should. Eliminating beef from your diet can lead to nutrition deficiencies, because the iron found in plant foods is not as easily absorbed by our bodies. So for those reasons, I’ll keep beef on my plate as part of a heart-healthy, balanced diet.